Blackhawk STRIKE - Elite Vest FREE SHIPPING! The BlackHawk Elite Vest will accept all MOLLE compatible equipment. The STRIKE GEN-4 MOLLE equipment was a collaborated effort between the BlackHawk Research and Development Team and numerous Military Elite Special Warfare Units. 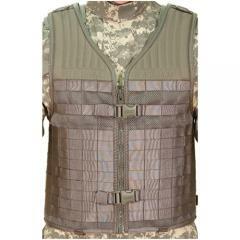 ©2002-2019 CopsPlus.com: Blackhawk STRIKE - Elite Vest FREE SHIPPING!